Looking for something scary and warm to wear this Christmas? Hoping to scare the relatives as you all sit down to some sweet yams and cranberry sauce? Well, Fright Rags has you covered in December, with new march from two of the most popular Christmas Horror movies ever made. Oh, and they have a few other surprises too. 2018 marked Fright-Rags' 15th anniversary, and the horror apparel company is bringing it to a close with holiday horror merchandise and more. The year's final releases include Silent Night, Deadly Night, Silent Night, Deadly Night Part 2, Krampus, House of 1000 Corpses, and Night of the Living Dead. A killer Santa is on the loose with Fright-Rags Silent Night Deadly Night and Silent Night Deadly Night Part 2 apparel. The 1984 slasher receives three new shirts, a classic design reprint, and an enamel pin with glittering snow. 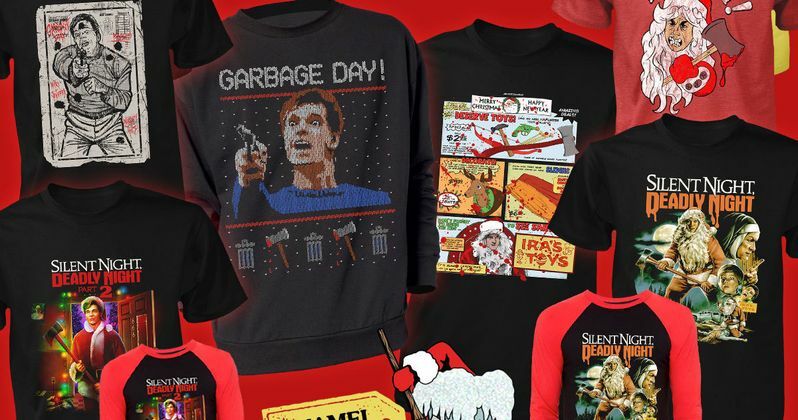 Its 1987 sequel has three tees (including Scream Factory's new Blu-ray cover art) and a "Garbage Day" faux ugly Christmas sweater. In the 1984 classic, An orphan raised by nuns (Lilyan Chauvin, Gilmer McCormick) grows up to be a killer toy-store Santa Claus. And in it's sequel, which actually culls a little too much footage from the first film for it's own good, the younger sibling of the teenager who killed while dressed as Santa carries on in his brother's bloody footsteps. Up next, deck your halls with Frightville Novelties' vintage-style Krampus decor. Based on Michael Dougherty's 2015 film, the set includes one large and six small double-sided, die-cut decorations. Fright-Rags has also reprinted a classic Krampus shirt and socks. In Krampus, while the holiday season represents the most magical time of year, ancient European folklore warns of Krampus, a horned beast who punishes naughty children at Christmastime. When dysfunctional family squabbling causes young Max (Emjay Anthony) to lose his festive spirit, it unleashes the wrath of the fearsome demon. As Krampus lays siege to the Engel home, mom (Toni Collette), pop (Adam Scott), sister (Stefania LaVie Owen) and brother must band together to save one another from a monstrous fate. Finally, Fright-Rags has added two more designs to its line of lounge pants: Rob Zombie's House of 1000 Corpses and George A. Romero's Night of the Living Dead. Made from moisture-wicking, stretch comfort fabric, the lounge pants feature an elastic waistband with drawstring and two pockets. Silent Night Deadly Night, Silent Night Deadly Night Part 2, Krampus, House of 1000 Corpses, and Night of the Living Dead collections are on sale now at Fright-Rags.com. Domestic orders placed by December 17 will arrive in time for Christmas. You can take a look at the new march here, which definitely needs to be under a few of your trees out there. Otherwise, what was it all for?